Complexity is the mother of all confusion. Why complicate things when we can just keep it simple! This is the philosophy by which this new app in town called AbridgeMe swears by. 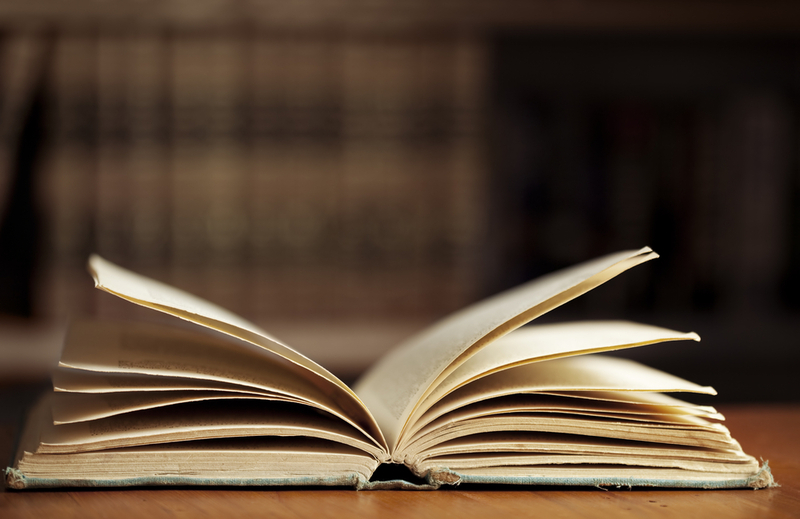 Its mission is to summarize any topic under the sun to a maximum of 100 words. In today’s fast paced world, many folks are looking for quick ‘elevator pitch’ style explanation to gain a basic understanding on topics. Well AbridgeMe is here to provide crisp and accurate summaries in order to help users get up to speed on various topics. AbridgeMe was ideated and conceptualized by Eric Rems and Roger Westfall. Eric and Roger met while developing electronic trading systems on Wall Street. Both of them have a passion for building and growing products, and have always wanted to take their products from just finance users to the masses on the consumer web. Roger is the more technical of the two, and operates as the company’s CTO while focusing on product design and development. His creative background as an artist and DJ shows in everything he develops. Eric, on the other hand, is the CEO of the company and focuses mainly on content generation, product marketing, and partnerships. Additionally, the duo has several part-time team members that help on the marketing and content generation fronts. 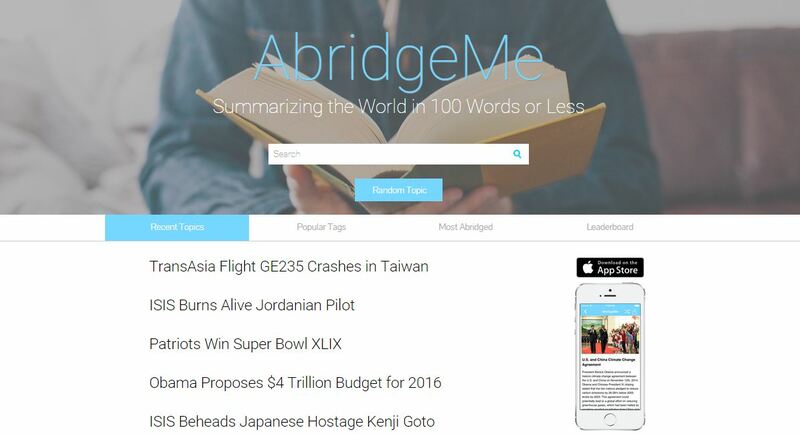 AbridgeMe is the world’s first crowdsourced reference website and iOS app (AbridgeMe Mobile) that is guaranteed to get you up to speed on a topic in ‘Always 100 Words or Less’. To put it simply, AbridgeMe is a cleaner, abridged version of Wikipedia that showcases and promotes the writers who help build the knowledge base and not hide them. The team through this app, wants to be the first stop on a learner’s journey to understanding any topic and allow the reader to come to speed so that they can proceed to in-depth research on the same. It is really hard to get good summaries about various topics under the sun. There is a dearth of unbiased, concise explanations on current and historical topics. AbridgeMe offers the perfect solution that guarantees that you will never receive an explanation on a topic longer than 100 words. You know for sure that when you look something up on AbridgeMe, you will find a fact-based, ‘elevator pitch’ style explanation, every time. If you desire, the team then helps guide you to learn more about the topic. Eric was unassumingly searching online for a brief, unbiased explanation of a fairly complex topic to email to his girlfriend so she could better understand what he actually did at work – perhaps putting some context to his late nights at the office. “You see, I worked in Finance Technology, she was in Nursing, and explaining the complicated financial regulatory overhaul “Dodd-Frank” easily and effectively was becoming rather difficult. To my dismay regarding this ‘simple’ online task, I found nothing – all of the resources out there had their problems: biased content, lengthy articles, inaccurate information, advertising overload, etc. none had delivered a well-written, concise, fact-based explanation for anyone to easily comprehend. It was this lack of clear cut and concise explanations, and the hope to solve that problem, that ultimately led me to create the AbridgeMe knowledge platform”, says Eric. As a startup, one of the hardest things faced by the team was to get discovered. Though the present users love their product, getting it out to the masses still continues to be a daunting task. In terms of competition, their biggest contender is Wikipedia. They do a great job in producing a ton of content and pretty much cover everything and have an army of contributors. Though what continues to frustrate Wikipedia readers is the extensive length of articles and the anonymity/edit-ability behind them. Also, the authors get no credit for their contribution. However, AbridgeMe is here to solve all these issues. Also, other apps like Circa, Yahoo Digest and Inside do pose as close contenders. “We wish to grow our content exponentially through strategic partnerships and vetted contributors and evolve our technology based on user feedback to make them even more useful to the masses. This includes development of an Android app to target the millions of people using Android devices”, says the team. Further, at the moment, the app is mainly targeted at anyone with an internet connection looking to get up to speed quickly on a topic. The team plans to monetize through partnerships with existing media companies to provide relevant content for their users to further dive into topics and learn more after getting a basic understanding (i.e. related news articles, videos, white papers, etc.). The additional content provided by their partners will further take users on a knowledge journey after getting a basic understanding on AbridgeMe. In short, AbridgeMe is here to give you a quick accurate summary of any topic under the sun in order to bring you up to speed. Previous articleUxplr: Your Tinder For Finding The Best Travel Destinations!